I’m on the value train today, with this sextuplet of sub $30 Shiraz to kick things off. When examining reds at this ‘value’ end of the spectrum, it’s always interesting to see how far best market price is from the RRP. A quick Google search, for example, lobs up that the Taylors Shiraz below can be found for close to $10/bottle in major supermarket bottleshops. Wines were tried as a bracket, and I went back and forward over a few hours. Always instructive to try so many similar priced wines together, particularly with regards to oak treatment, tannins and length. Considerable difference between the most and least impressive wines. ‘Ripe berry fruits with grainy tannins closing the long finish’ according to the back label. I didn’t see the tannins as grainy, but this gives you everything you’d ask for in $25 Barossa Shiraz. It’s a very different wine compared to the other Barossan reds in this lineup with an extra level of concentration. Jubey black fruits, toasty oak and then a mid-palate and finish that goes beyond simple fruit juice. Toasty oak is a bigger player compared to some but with the fruit to match. Silky smooth. Easily the most tannic of this bracket, and all the better for it. Should look even better as the oak settles down. Best drinking: 2017-2025. 17.5/20, 91/100+. 14.5%, $25. Would I buy it? I’d go a glass or two. From two vineyards in the Sellicks foothills. Just 12 barrels produced, and yet this is $6 cheaper than last year! Easily the darkest wine of this bracket, tending blood red. Vanilla oak an initial statement along with plenty of red fruit. Wes always makes wines with plenty of power, and no difference with this wine – plenty of power. Alcohol and oak are both too dominant for the moment. In 12 months time this should impress though and a real sense of something substantial. Best drinking: 2018-2028. 17.5/20, 91/100+. 14.5%, $24. Would I buy it? A glass would do. More later. Sourced from 10 different Shiraz blocks in the Barossa, with time on skins varying from 7-50 days. Spends 10 months in mostly old hogsheads. Slightly closed, initially, with red fruit nose and coffee oak nestled in there too. Still very much a primary fruit style, though the wood is noticeable for an older oak matured style. Alcohol warmth a distraction on the finish, especially as this isn’t particularly tannic. Length is pretty good though, tannins aside. A good effort, really, without the power or structure to kick things further. Best drinking: 2017-2025. 17/20, 90/100. 14.8%, $28.50. Would I buy it? Not quite. Booze intrudes too much for mine. All Barossa fruit, with a wild ferment to get things started and then cultured yeasts to finish ferment. Vegan friendly! Spends 13 months in new American octaves and hogsheads(11%), new French barrique and hogsheads (6%), the balance older octaves, barrique and hogsheads. Numbers: TA 6.1g/L, pH 3.57. Deep red, the oak really lifts this up, giving chocolate richness that fleshes out the plummy palate, complete with some light tannins to finish. Juicy and primary, but offers plenty of depth for the pricepoint. If you can find this for sub $18/bottle this is good buying. Best drinking: 2016-2023. 16.8/20, 89/100. 13.5%, $22. Would I buy it? I’d go a glass for sure. 90/10 American/French oak. I like the ‘Optimum Drinking Sensor‘ on the back label; drinking wine too warm/cold is an Aussie drinking bugbear. Deep purple red, luscious and juicy, this has lots of boysenberry fruit here and good concentration but not especially serious, minimal tannin. Affable but pretty simple juice for immediate drinking. Quality-wise it is just ahead of the Galway, but I was disappointed that this lacked some of the grunt of Taylors Shiraz of yore. Solid buy at just over $10, but less so for $20. Best drinking: 2016-2020. 16.2/20, 87/100. 14%, $20. Would I buy it? Not for the full RRP. New label for Galway and it looks good. This is from the Barossa Valley, which is impressive for this pricepoint. Numbers: TA 5.8g/L pH 3.6. Plum red ruby, the open-knit nose is all plum fruit with a light, shortish finish. Simple, juicy commercial red, but well made. Offers up plenty of flavour for few dollars, though without the seriousness for much more. Best drinking: 2016-2020. 16/20, 87/100. 13.5%, $18.99. Would I buy it? I’d go a glass at a regional pub where this would be a reliable option. Andrew, this is a great test of six. I often have a two wine comparison with dinner, leaving the botts open for the next night or two. My first question is probably rhetorical – surely you don’t spit, and secondly, as I assumed you swallowed, how affected by the alcohol do you get after a few hours? I know if it was me, a couple of panadeine fortes would help out down the track to ease the temple tom toms. Ha. I always spit in tastings like this. If something is really good I’ll roadtest it at dinner, but otherwise I’m super vigilant about drinking at home. Re the Taylor’s … the silliest thing about their pricing is that they keep issuing “special offers” and “exclusive deals” to fans via their online mailing list. 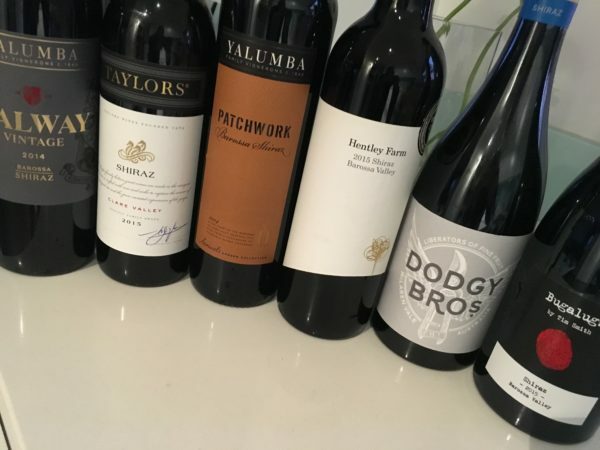 The latest was 12 of their 2014 shiraz, cabernet and merlot”estate wine” at $192 – a so-called discount of $28 plus free shipping! (their exclamation mark). It’s usually a dependably average drop that delivers at Dan’s discounted special prices but the “Cellar Door” offers leave a very bitter taste. In fact, the cellar door is probably the only place on earth you’d pay more than $14 a bottle. Question is, who else is exploiting mug customers who make the mistake of thinking signing up will give them special treatment and prices? Lots of big winemakers are in that same boat. Look at Grant Burge as another example.